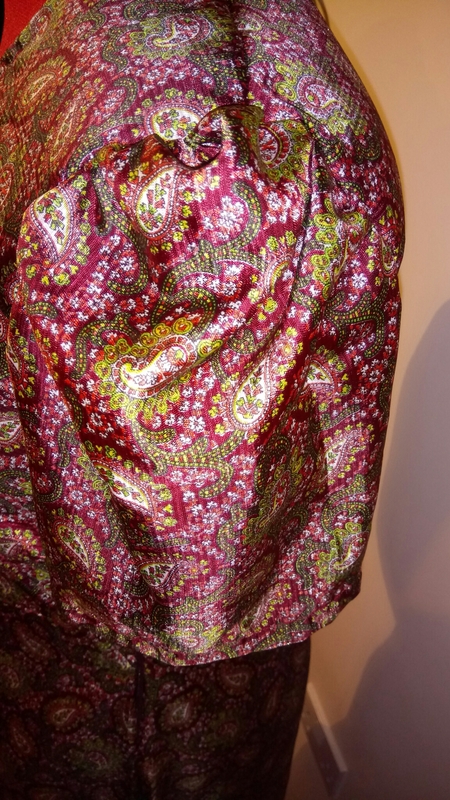 I dragged my Mum round some vintage shops in, Stockport, the town where we were brought up a few months back and picked up some vintage paisley silk feel fabric. I got 3 metres for £9, which was a bargain. 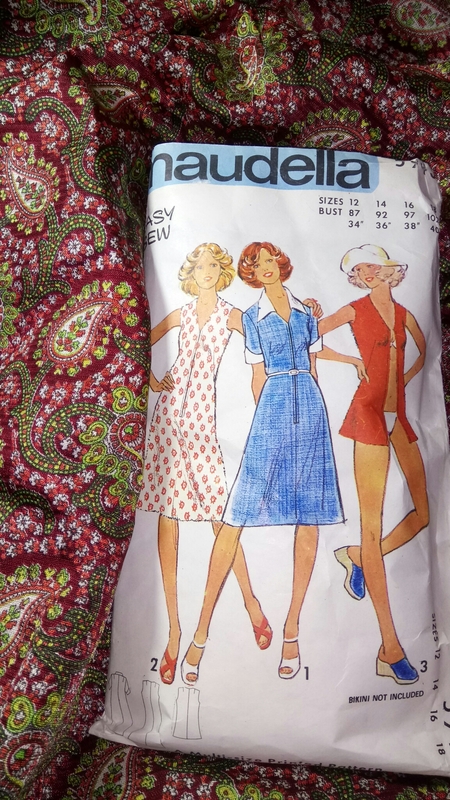 I stashed it for a bit and then decided to return back to my 1970s Maudella dress. I love the fabric, the colours are so Autumnal. Like last time, I missed the collar out and put the zip in the side instead of along the front, which is much neater, I might add. I graded it down slightly in the waist, as I felt I needed it last time. I also made the sleeves a little larger just to make it more comfortable and I made them a bit shorter. It needs lots of ease in the sleeves, but I like the effect. 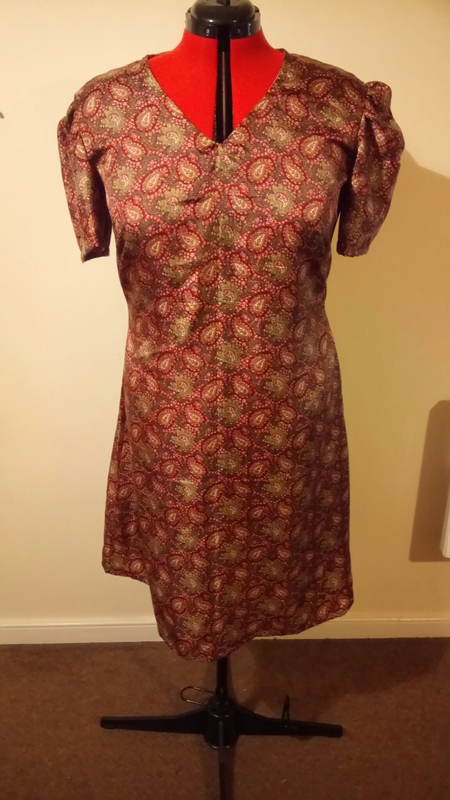 It was the first dress for my dressmaker dummy too, which was fab to use, it made the hem length really easy. I have named her Suzie. I did the hem a bit longer than last time so it falls below my knee, not Suzie’s, she doesn’t have knees! That’s it! 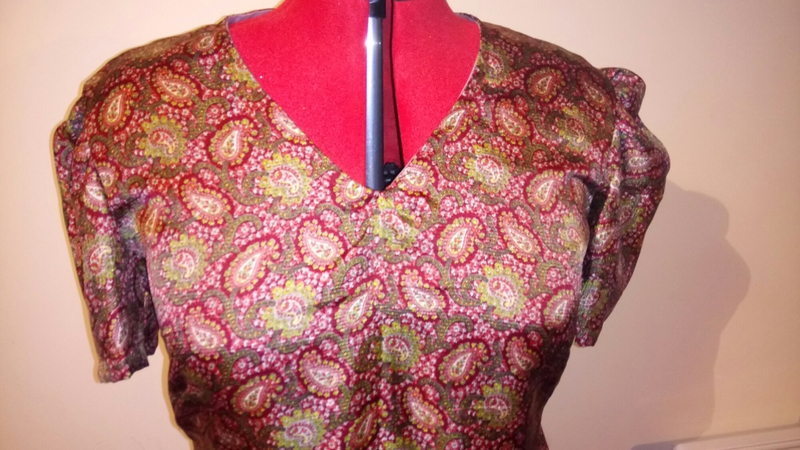 I love this super quick make and I’m really pleased I chose a vintage pattern for my vintage fabric! I wore it to have a minichino with my lovely niece! 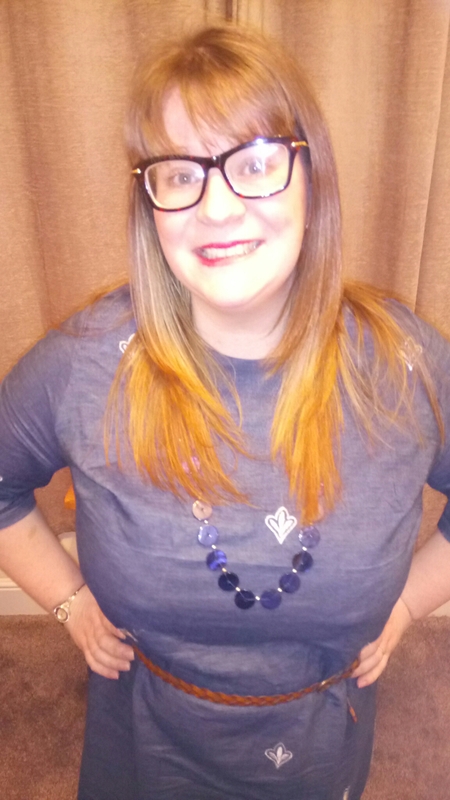 Today, I have been nominated for the Blogger Recognition Award by two people; Green Eye Crafts and Linda of Nice Dress Thanks I Made It, who I love chatting to and does a great Designer Copying Competition, which I’ll be entering soon! I am really pleased to have this because I haven’t been blogging long. When I first starting blogging, I didn’t expect a community which was so expansive and welcoming and I’m really pleased to be part of it; being able to chat and get inspiration has fuelled my passion even more. 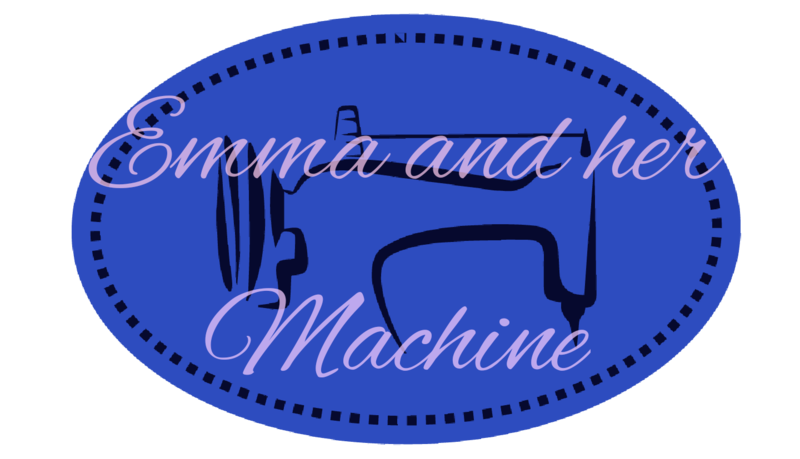 I don’t know anyone in the human world who sews and this was the reason I started blogging. 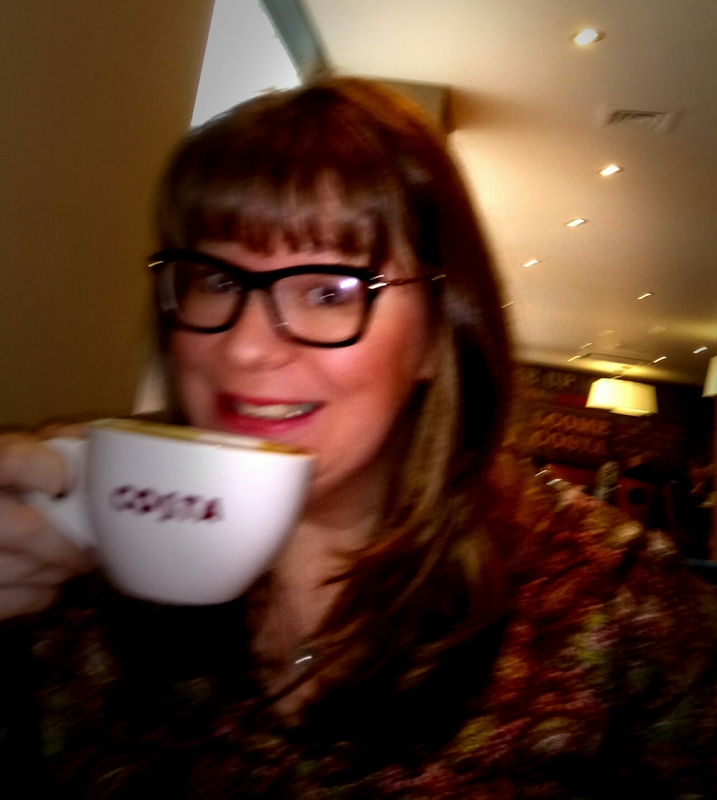 My advice for new bloggers is to get involved, everyone loves a comment on the blogs they have taken the time to write. Secondly, be yourself, people are much more likely to like you! It’s Always Autumn has some fab ideas! Please don’t feel obliged, it’s only a bit of fun and I’m sure plenty of people have seen things like this before, I just wanted to join in as I’m so pleased that people have thought of me! My usual Friday post will be up tomorrow! 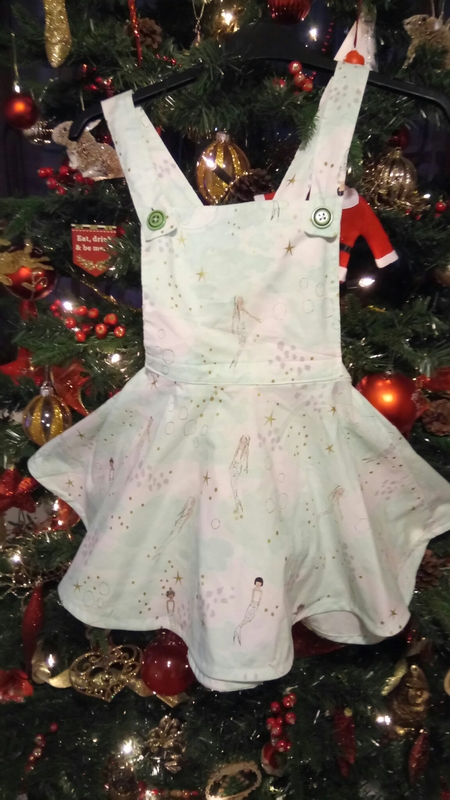 Following the successful make for her birthday, I wanted to make a dress for my sister for Christmas, she has a very different style from me but when I saw the Overture Set which came with Issue 20 of Simply Sewing Mag a few months a go, I knew that would be the one. 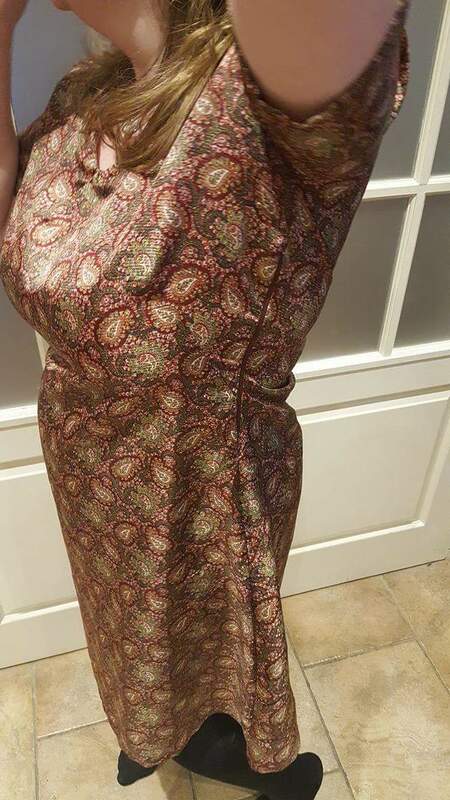 I bought this amazing silk feel fabric from the sale at Abakhan and I thought it would be perfect for this as the dress looks nice and floaty. 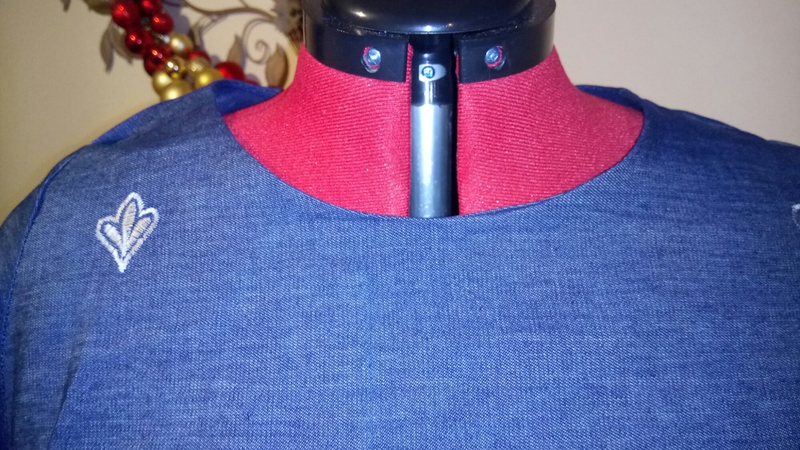 I read through the instructions before I cut the pattern out and was very quickly overwhelmed, I had never done a collar before… I was in two minds, one said, try it or else you’ll never learn, the other said, you’ll never be able to do that. I went with the latter I’m afraid folks and decided to leave the collar out. 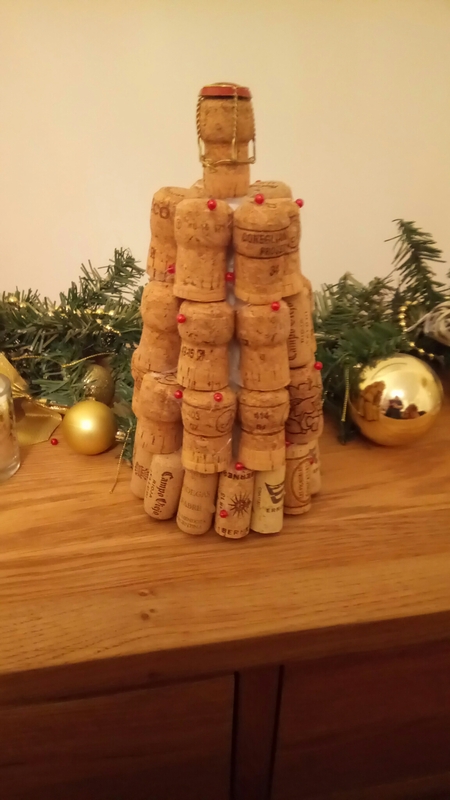 I might have tried it if it hadn’t been for a gift but I want it to be lovely. The fabric, whilst beautiful, was an absolute PAIN to sew. I haven’t done much work with slippery fabrics like this and what a nightmare! 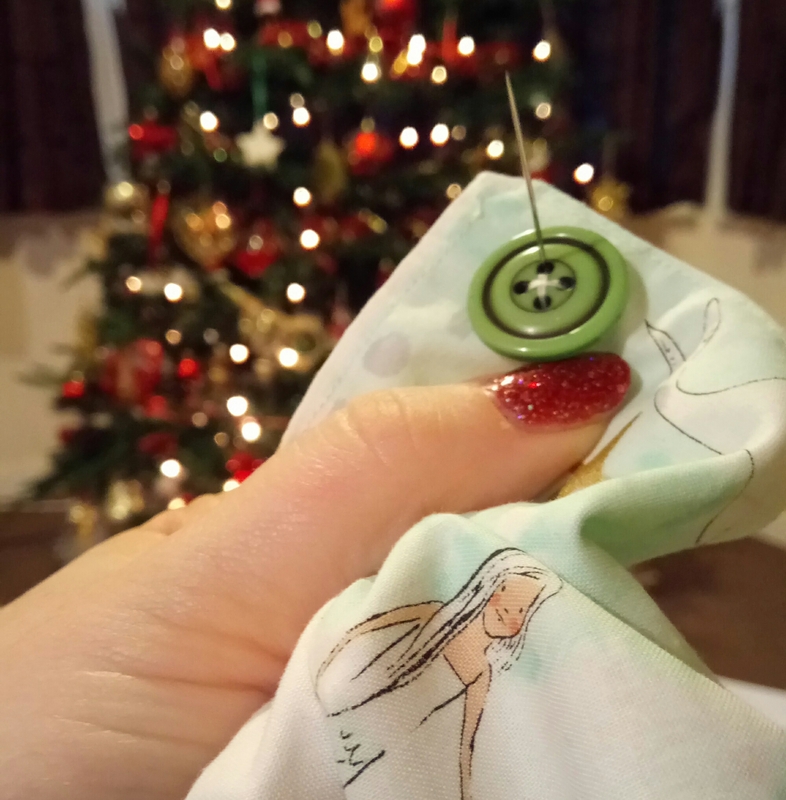 I had to use about a million pins and even then I couldn’t be sure that another piece of fabric was slipping in from somewhere… It also slipped off my desk constantly too. It was my first time working with a yoke and that was even more difficult because of the fabric. 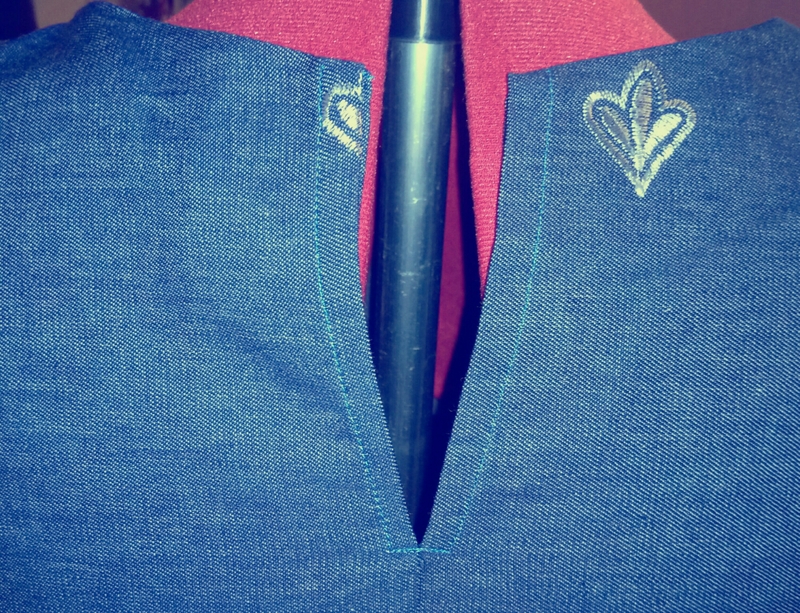 I don’t think I did this right because the seam allowance looked a mess… so I used a bit of bias binding to hem the seam allowance on the yoke. It looks quite neat now but I need to learn how to do this properly. I have since watched this video on how to sew a yoke by Sew Over It and I think I’ll be able to do this next time! I used it more successfully in this shirt for my brother. I was tempted to also ignore the pockets but as I blatantly cast aside the collar, I felt I best try these at least. I did have to unpick two of them completely though because I lined the wrong notches up but I was determined by this point. 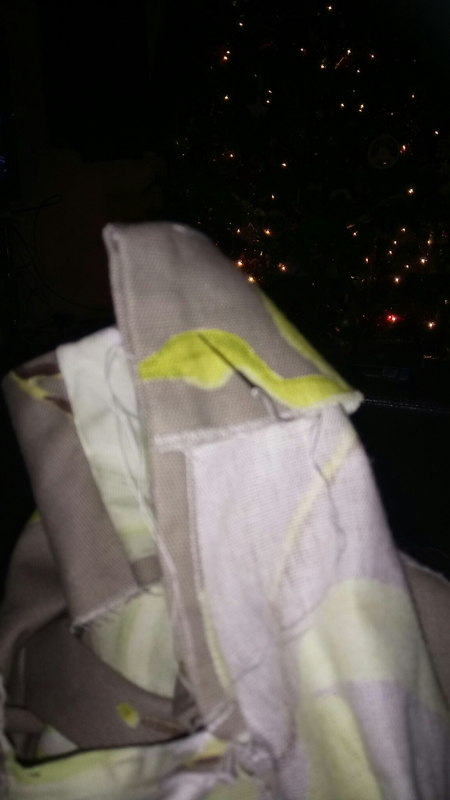 The pattern comes with really good instructions on how to insert the pockets whilst maintaining the French seam, which was really useful to learn.My next challenge was the arm hole binding and the hem. 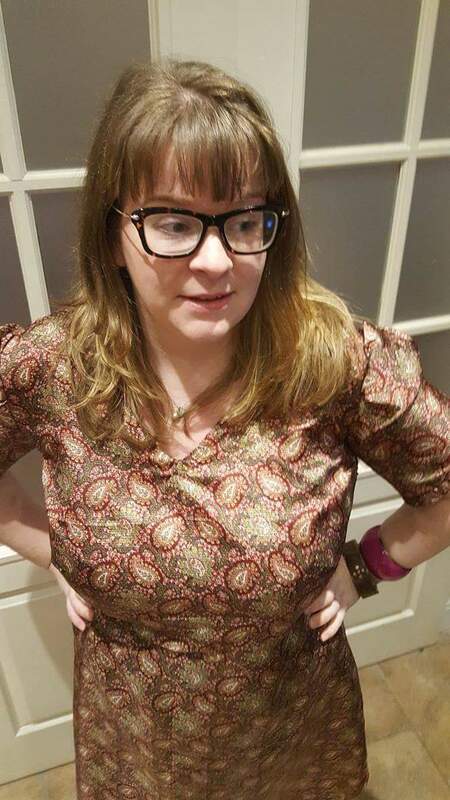 I wanted a neat finish that would not look bulky or ruin the flow of the dress, this is really tricky on silky fabric so I used a black ribbon as I thought any other binding would be too restrictive. 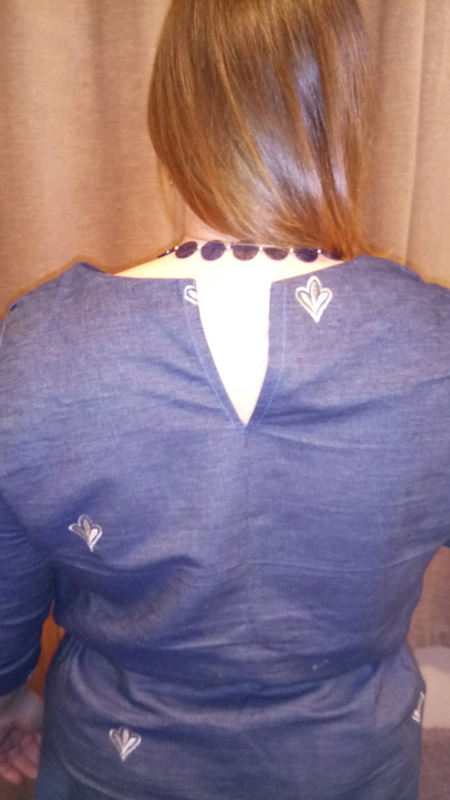 The neckline doesn’t sit as perfectly as I would like, I maybe need to consider using facings next time. I also used a thicker black ribbon to bind the hem, which is longer at the back than the front. I thought it would make a neater finish and I was right because I do feel it is neat and quite modern looking. 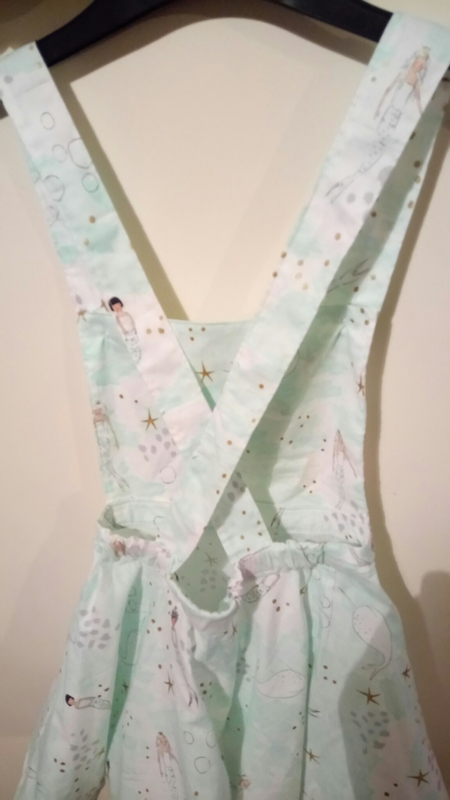 A couple of months a go (Sew Saturday in October) I bought some of the Michael Miller Magic fabric range with the intention of making a dress for my niece. I love this range, the fabrics are so pretty and bright; perfect for little girls. The lovely lady in the shop told me a metre would do one of the pillow case type dresses you see for little ones but I wanted to try something different. 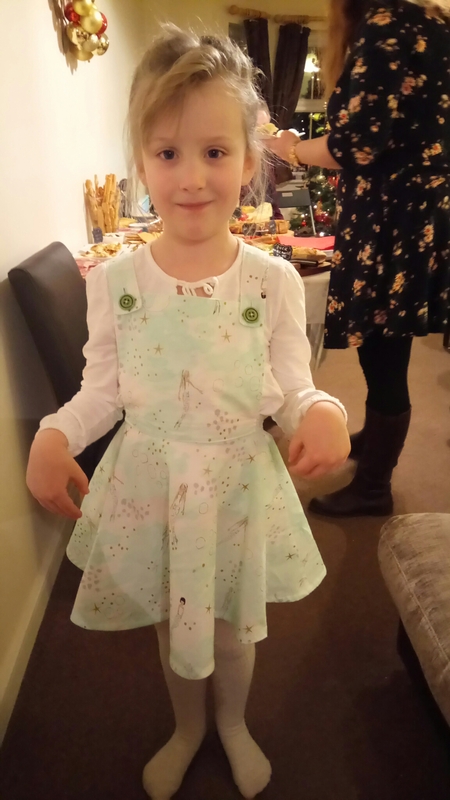 She loved the dungaree set I made in October so I decided to make one similar but draft it myself… I used a circle skirt pattern by I Think Sew because I didn’t feel confident drafting one myself after my last one didn’t fit. I did draft the waist band though as I wanted to put elastic in the back to make it child friendly and comfy. I measured her waist… and her height and her head and everything else she insisted I measured whilst I was at it. I’m 168cm if you’re interested! I then added 4 inches extra to the measurement needed for the back piece to allow for the elastic and gathered the skirt slightly to fit. I then used the Sunday Set pattern by Cotton and Chalk to draft a tiny version of the top half and the straps. I was going to do a pocket but I literally used all this fabric! It all came together nicely. I used French seams as I wanted it to last and everything else was stitched right sides together and then top stitched once turned out. 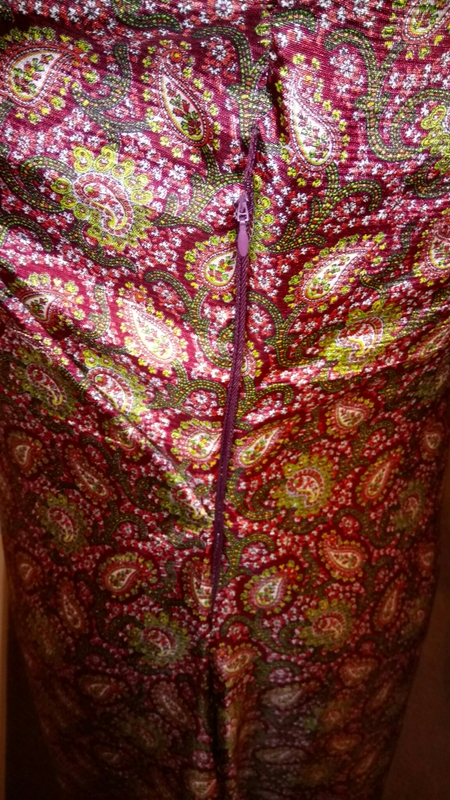 I hate hemming circle skirts though so I made a binding out of the tiny bit of fabric I had left so I had a neat finish. 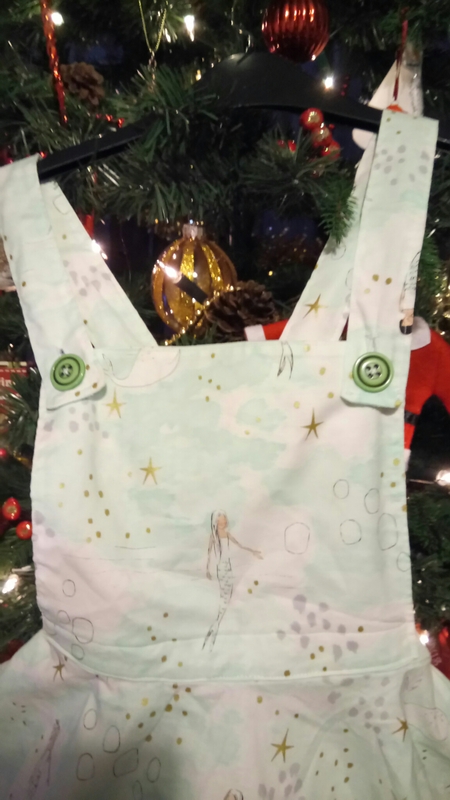 I finished it off with some bright green buttons, anything pastel just seemed too blah… I added some buttons holes and I was done. I think it is the cutest thing in the whole world and I wrapped it with some white tights… It’s winter after all. 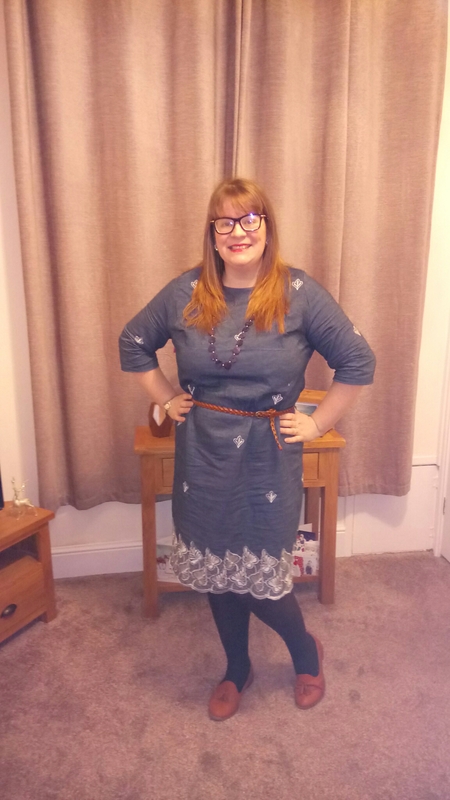 She loved it and wore it to our Boxing Day party, gorgeous or what?! She’s easily my favourite model! Sorry for the Christmas themed pictures but I needed to share this… It’s just so sweet! 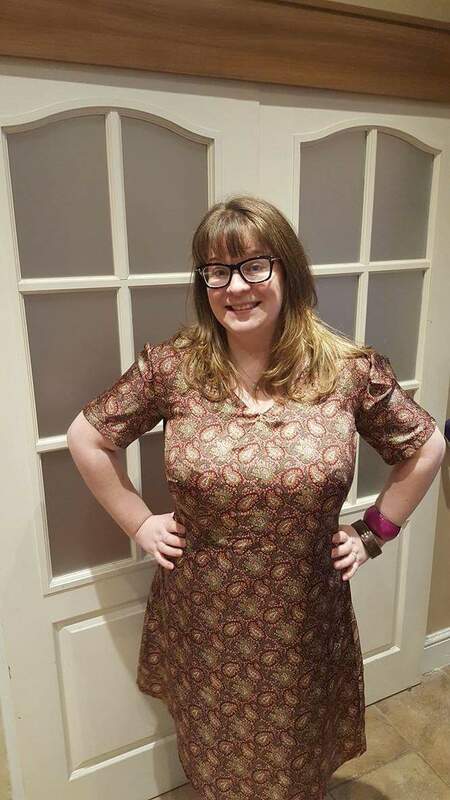 This is my second shot at the ultimate shift dress from Sew Over It, the first being for my Mum. It’s a great, easy pattern so I wanted one for myself. 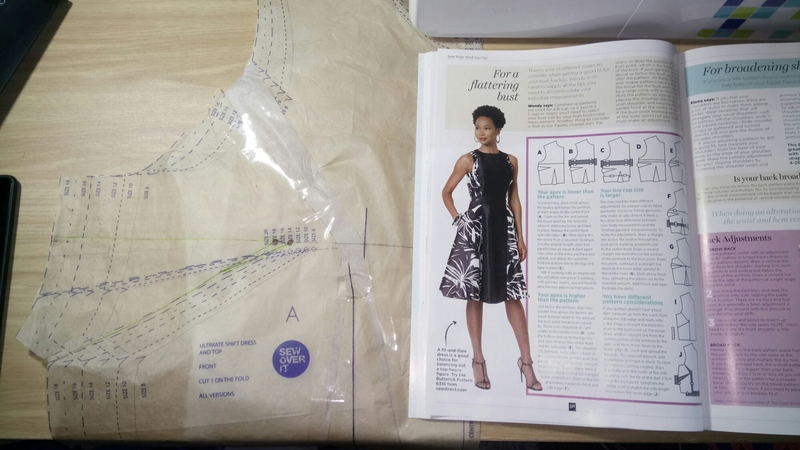 I know from making my Mum’s that it is tailored for quite a small bust so I referred to the Sew Style Bookazine, I have because I was featured in it, to take the pattern out to account for my chest or an FBA as I have since learnt. 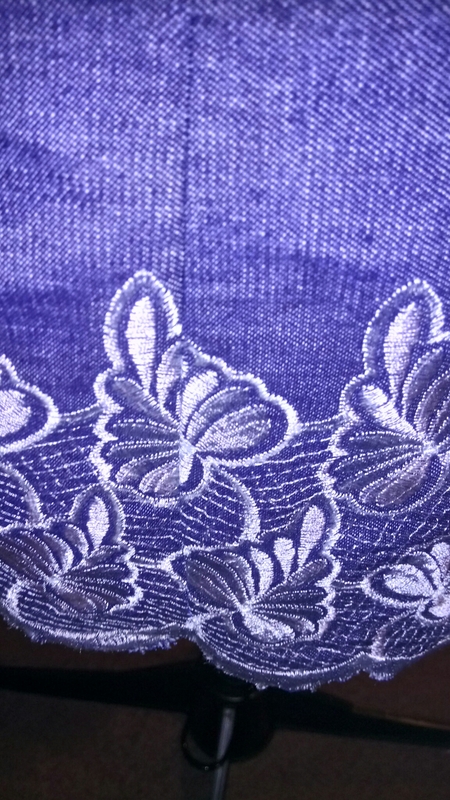 I made it in denim, which I bought because I haven’t used denim yet but it has a brilliant white embroidered lace detail on the bottom of it. 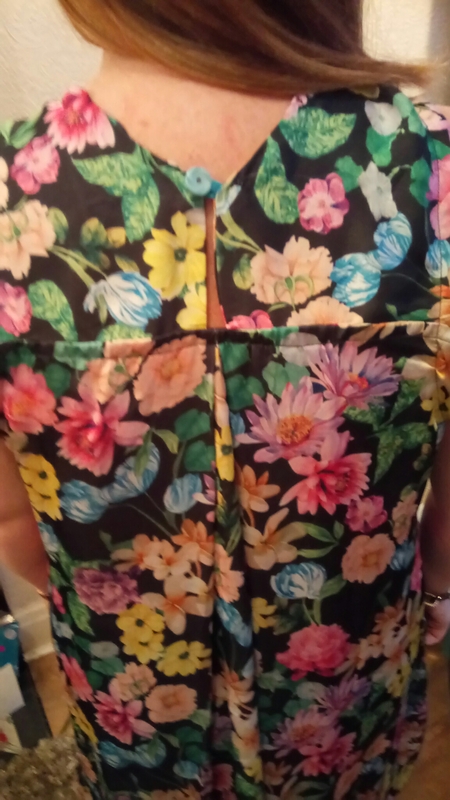 I knew I wanted to use it for the hem, so I cut it to make the most of the pattern. I also made it a little longer as I wanted to embroidery on my knees, not above them. 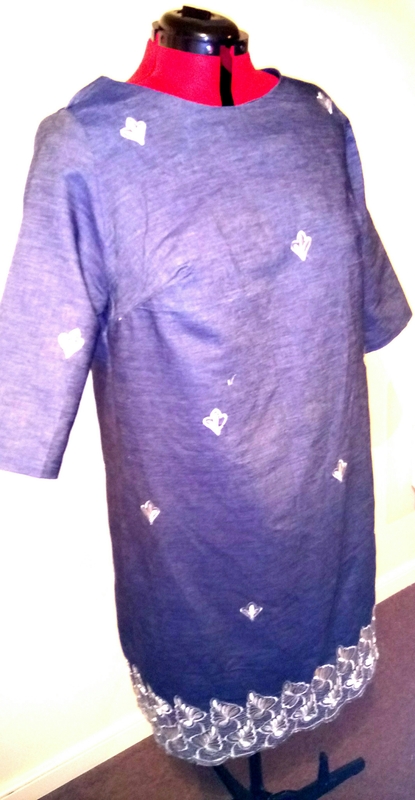 I only used it on the bottom and cut the sleeves from the rest of the fabric. 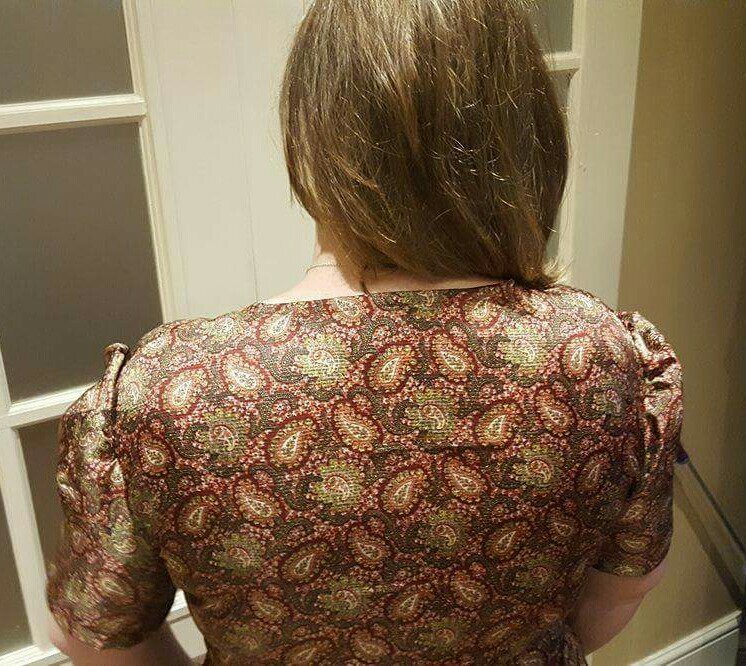 The dress goes together really easy and there isn’t much else to say apart from, check out the amazing bit of pattern matching I have managed to do on the lace… Yay! I wore this for New Years Eve. We don’t do anything big, just a chilled night of games and food at my sister’s. 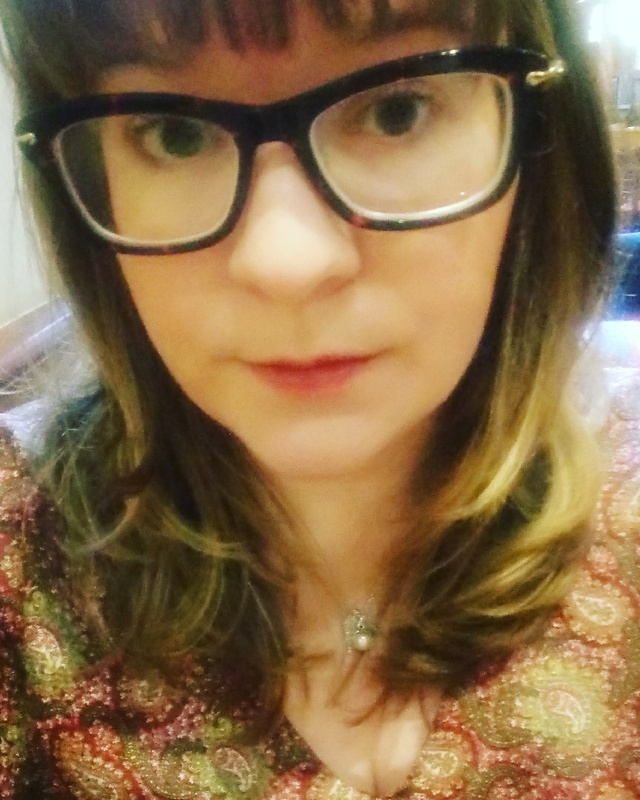 This dress was perfect for it, lovely and snug. 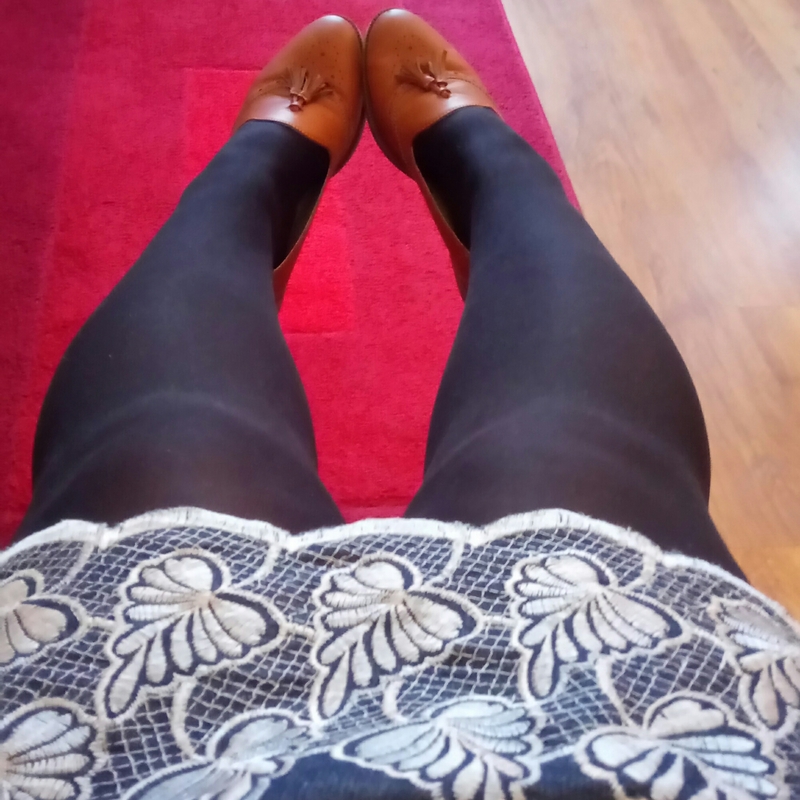 I cinched it with a brown plaited belt and my brown brogues with a blue beaded necklace. 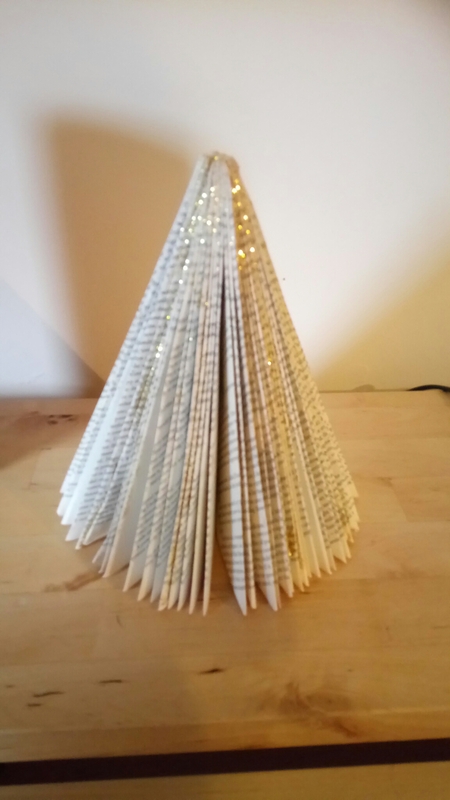 I’m definitely making more of these! I probably shouldn’t mention that the new denim turned my skin bright blue, even with the pre-wash… It was even worse than washing off the New Year I spent dressed as an alien (don’t ask)! I feel really proud of this make for a few reasons, one because it all came together so well, all the notches lined up and I didn’t have to make any changes. Two because it was the first time that I have really flown through a pattern and the instructions without having to look things up or getting confused, which I think shows how much I am improving; all the practise is paying off! 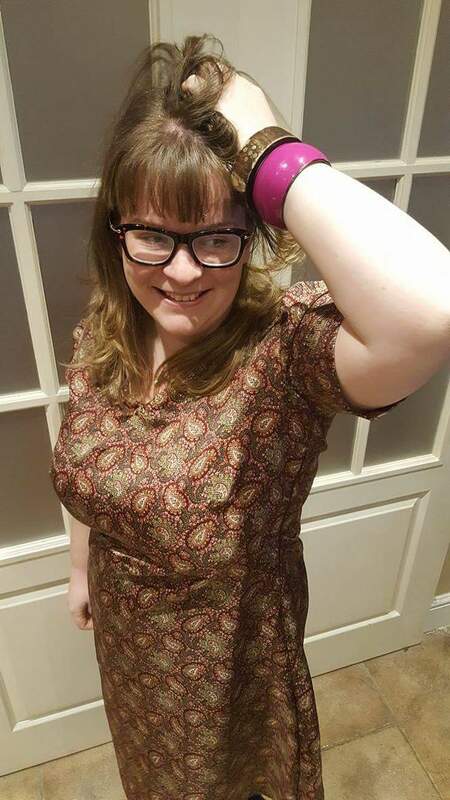 Thirdly, look at my fabulous facings… I wanted to try them as I know the shift dress has quite a smooth look and I didn’t want to ruin it by using binding. This is quite literally the first time facings have EVER worked for me. They sit nice, they pressed nicely and they joined really well at the split in the back. I don’t know if this is because the pattern is fab, the fabric was so easy to work with or because I’m just getting better, either way, I’m chuffed to bits with my little shelf! That’s all there really is to say about the dress, which has a really simple construction. I intend to try a top version of it, possibly in a light denim I’ve just gifted myself for Christmas. I have also just bought some ponte roma with poppies along the edge so I can try using a fabric with design for my next try at this so watch this space!.. 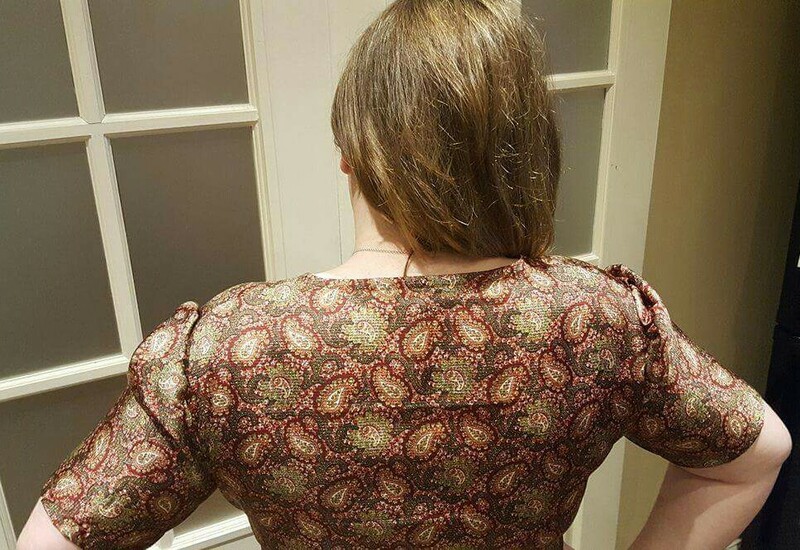 The back lined up great too, I managed to keep the pattern direction going. I also put this lovely, cute little ‘made with love’ label in.